Сегодня нам предстоит выполнить 12 упражнений на Present Perfect, поэтому освежите в памяти схему его образования. отработать употребление for и since, a также already, never и yet. Наличие ответов к упражнениям поможет вам проконтролировать собственные результаты или результаты ваших учеников. Возможно, Вам полезно будет ознакомиться с примерами предложений в Present Perfect. 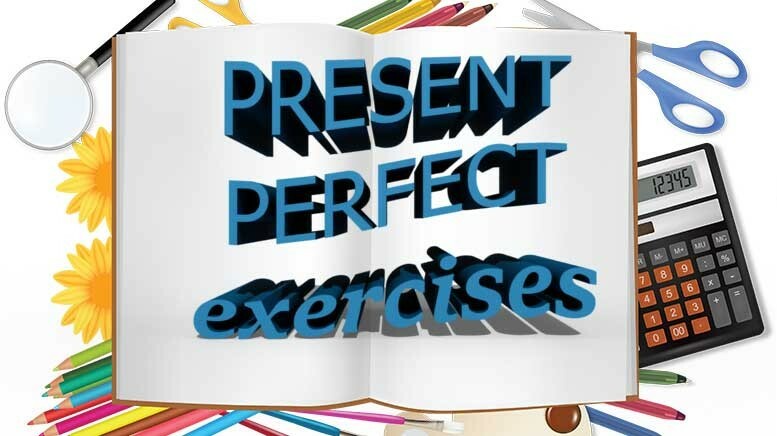 Форма глагола в Present Perfect Tense. Exercises. Упражнение 1. Заполните таблицу, используя следующие формы глагола. Complete the table with the base forms and the past participles. Use the words in the box. Утвердительные предложения в Present Perfect Tense. Упражнения. Упражнение 2. Поставьте глаголы в скобках в Present Perfect. She _____ (score) twenty points in the match. We _____ (watch) all the Champions League matches this season. That's amazing! She _____ (run) fifteen kilometers this morning! She _____ (buy) some really nice rollerblades! Oh, no! I _____ (lose) my money! My mum _____ (write) shopping list. It's on the kitchen table. Dad, you _____ (eat) my biscuit! I’m tired. I _____ (watch) three X-Files videos. Hurry up! They _____ (start) the film! Mary _____ (study) hard this year, so she'll pass her exams. Oh no! She _____ (drop) the plate! The garden is very green. It _____ (rain) a lot this month. These are my favourite trousers. I _____ (have) them for five years. Tom's my best friend. I _____ (know) him for three years. They _____ (live) in Miami for two years. Jo has earache. He _____ (have) it since 7 o'clock. Brad _____ (live) in Chicago since 1998. Отрицательные предложения в Present Perfect Simple. Упражнения. Упражнение 3. Поставьте глаголы в скобках в Present Perfect negative. I _____ (not clean) my football boots. They _____ (not start) their meal. I _____ (not do) my homework. He _____ (not win) all his matches this year. My brother and I _____ (not see) any films this week. It's my birthday party today. I _____ (not invite) many people. He _____ (not wash) his hands. They're very dirty. Mum's really angry. We _____ (not tidy) our room! I can't play with my friends this evening. I _____ (not finish) my homework. I _____ (not visit) New York for three years. Where's Alison? We _____ (not see) her since yesterday. Dad _____ (not take) a holiday since last August. John _____ (not play) the violin since he was school. Упражнение 4. В письме есть 4 ошибки на использование for и since. Найдите и исправьте их. These are some sentences from Nigel’s letter home from Africa. He has made four mistakes in using ‘for’ and ‘since’. Correct his mistakes. I've lived in Africa since two weeks and I love it! Africa is beautiful! I haven’t travelled to any faraway place for last summer. I’m so happy now! I’ve already seen Mr. Rambler. He is working for WWF here and taking photos of wild animals. I haven’t seen any lions yet. I think I’ll see them later. Thank you for the trip. I’ve dreamed of Kenya for my childhood. I haven’t seen you since ages! I miss you so much! Упражнение 5. Дополните предложения словами for или since. Complete the sentences. Use for or since. I've lived in Washington _____ 1997. Ben has studied English _____ three years. They haven't visited their grandparents _____ months. Julie's ill. She's been in bed _____ Tuesday. My dad has had his car_____ sixteen. It's been ten years_____ we moved to Oxford. Упражнение 6. Пользуясь опорными словами, a также словами for и since составьте предложения в Present Perfect Simple. She / not eat / anything / this morning. She / not see / her friends / a week. She / stay / at home / Tuesday. She / have / a red nose / three days. She / not play / basketball / last weekend. She / not do / any school work / Monday. Больше упражнений на for и since. Вопросительные предложения в Present Perfect Tense. Упражнения. Упражнение 7. Zork и Zena – инопланетяне, впервые прилетевшие на Землю. Они составили список дел. Напишите вопросы и ответы о том, что они уже сделали, а чего пока нет. Has Zork eaten a hamburger? Zork and Zena (drink) a cola? Have Zork and Zena drunk a cola? Zork and Zena (speak) English? Zork (swim) in the sea? Zork and Zena (drive) a car? Упражнение 8. Напишите вопросы в Present Perfect, используя глаголы в скобках. Дайте правдивые ответы. — Have you ever eaten Italian food? Упражнение 9. Дополните диалог вопросами и ответами в Present Perfect. Reporter: (you do) Have you done a lot of training this year? Trish: Yes, I have. I have trained six times a week all year. Reporter: Who ______________ (1 you train) with? Trish: With my coach, and the team. Reporter: Where ______________ (2 you play) this year? Trish: Mostly in Britain. But we've also travelled to Holland. Reporter : ______________ (3 you win) many matches? Trish: Yes, we (4) ______________ . Reporter: And how many matches ______________ (5 you lose)? Reporter: That's great. ______________ (6 you have) any injuries? Trish: No, I ______________ (7) . Reporter: Thanks, Trish, and good luck. Упражнение 10. Напишите вопросы с How long. Дополните ответы, используя for или since. Write questions with How long. Complete the answers with for or since. 2 My parents work in a shop. 3 My sister knows Robbie Williams. 4 We've got a new car. Комплексные упражнения на использование Present Perfect Simple. Упражнение 11. Заполните письмо Джейн глаголами в Present Perfect. Complete Jane's letter to her American friend. Use the Present Perfect Tense. I _____ (1 not have) a letter from you for a long time. _____ (2 you lose) my address? I bought the new Steps CD at the weekend. I _____ (3 already listen) to it. _____ (4 you hear) it yet? It’s brilliant. There’s a new video too, but I _____ (5 not see) it yet. School is going OK. I _____ (6 just finish) some exams, but the holidays _____ (7 not start) yet. We’re going to Ireland. I _____ (8 never be) there. Write soon with your news. Упражнение 12. Ник готовится к путешествию. Он собирается навестить бабушку. Ознакомьтесь со списком дел, которые ник планирует сделать до отъезда. Напишите, что он уже сделал, а что нет. Используйте alreadyи yet. Nick is getting ready to travel. He is going to visit his Granny. Read the list of things he must do before travelling. Write what he has done and what he hasn’t done. 1 has finished, 2 has scored, 3 have watched, 4 has run, 5 has bought, 6 have lost, 7 has written, 8 have eaten, 9 have watched, 10 have started, 11 has studied, 12 has dropped, 13 has rained, 14 have had, 15 have known, 16 have lived, 17 has had, 18 has lived. 1 have not cleaned, 2 haven’t started, 3 have not done, 4 hasn’t won, 5 haven’t seen, 6 haven’t invited, 7 has not washed, 8 haven’t tidied, 9 haven’t finished, 10 have not visited, 11 haven’t seen, 12 hasn’t taken, 13 has not played. Kate has been in bed for a long time. She hasn’t eaten anything since this morning. She hasn’t seen her friends for a week. She has stayed at home since Tuesday. She has had a red nose for three days. She has not played basketball since last week. She has not done any school work since Monday. Has Zena seen a film? Yes, she has. Have Zork and Zena spoken English? Yes, they have. Has Zork swum in the sea? No, he hasn’t. Has Zena visited the Acropolis? Yes, she has. Have Zork and Zena driven a car? No, they haven’t. 1 have you trained, 2 have you played, 3 have you won, 4 have, 5 have you lost, 6 have you had, 7 haven’t. How long has he been a teacher? He has been a teacher since September. How long have they worked in a shop? They have worked in a shop since 1992. How long has she known Robbie Williams? She has known him for six month. How long have you got a new car. We have got a new car for two weeks. Nick hasn’t taken his library book back yet. Nick hasn’t cleaned his shoes yet. Nick hasn’t cleaned the parrot’s cage yet. Nick hasn’t changed the water for the fish yet. Надеюсь, упражнения на отработку английского времени Present Perfect Simple понравились вам и оказались полезными. 49 Комментариев для "Present Perfect Tense. Exercises. Упражнения на отработку Present Perfect Simple"
А где ответы на 9 номер? не могу разобраться:(.Может что то пропущено? В упражнении 5, во втором предложении можно использовать и FOR и SINCE, просто будет другой смысл, разве нет? Ben has studied English since three years. — Бэн учит английский с 3 лет. Ben has studied English for three years. — Бэн учил английский три года. В упражнении 5, во втором предложении можно использовать и since и for, просто будут предложения с разным смыслом. Разве не так? Почему не получается оставить комментарий? Ben has studied English since three years. — Бэн учит английский с 3 лет. Ben has studied English for three years. — Бэн учил английский три года. Было бы здорово увидеть упражнения на перевод с русского на английский с возможностью проверки. Пожалуйста, Вадим. Да, я планирую сделать нечто подобное в разделе с тестами. Спасибо огромное за задания. Очень понравились и хорошо закрепили тему. Есть два вопороса по ответам. 1. В ответе на задание номер 9 в первом предложении действительно с «who» писать «have»? 2. В ответе на задание номер 6 ошибка в пятом предложентии « for three year». Ещё раз большущее спасибо. Это лучший сайт, что я находил в интернете! Спасибо вам! Пожалуйста. Евгений. Спасибо за мотивирующее меня мнение! Объясните пожалуйста, почему в 5 упр. В последнем предложении про Оксфорд ставится since, я поставила for. В 6 упражнении в задании 5.She / have / a red nose / three days. А в ответе She has had a red nose for three years. Vladio, Вы придираетесь. У меня эти брюки уже 5 лет. Нормально все. А вдруг я их и не носил, купил и не носил??? Подборка упражнений очень разнообразная. Мне понравилась схема, она отражает основные значения временной формы. Чудесный сайт!Обилие хороших упражнений избавляет от поиска других сайтов в сети.Огромное спасибо! Спасибо за задания! Возник вопрос есть ли разница have not и haven't? В Задании 3 я везде написала haven't, a в ответесли по разному. Спасибо огромное создателям сайта, отличные упражнения! В 10 упражнении 4 нельзя ли have you had использовать? Добрый день! Вопрос по упр.6 фраза 6. Объясните, пожалуйста, почему нельзя употребить for (в значении «не играла в баскетбол на прошлой неделе»). В чем моя ошибка? Скажите пожалуйста почему since и for используются в present perfect если эти слова для perfect continues for all forms. Я сломала себе голову. Занимаясь. Мне кажется, в 3 задании не Past Perfect, а Past Perfect Continuous, потому что там такие слова, как: Since, For, которые указывают на время Present Perfect Continuous? Ramil, Since и For указывают на Perfect в целом, на любой не обязательно на Perfect Continuous. Например: I have known him for ages. I have known him since 5 yaers old. Здравствуйте, спасибо большое за ваш труд! Просто отличный сайт, все очень доступно и подробно расписано, а подборка упражнений и тестов (их обилие) это то чего не хватает многим другим сайтам. И что вы отвечаете на комментарии тоже большой плюс. Спасибо вам! Вопрос по 10 упражнению, 4 предложение. Можно ли написать How long have you had got a new car? Употребляется ли have got Present Perfect? How long have you had got a new car? — так нельзя употреблять. have got — это уже Present Perfect, получается, что вы пытаетесь поставить Present Perfect в Present Perfect.